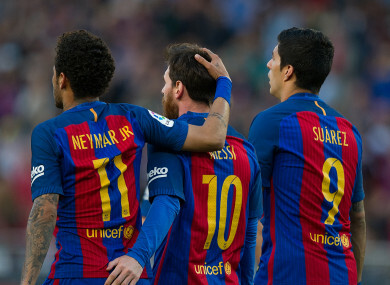 MSN: Messi, Suarez and Neymar. The Brazil international became the world’s most expensive player when he moved to Paris Saint-Germain for a fee of €222 million from the Camp Nou side last summer. “Proud to wear the new jersey and to continue giving you joy,” read his caption, with an image accompanying it of him in the club’s new kit. “I don’t think there’d be any problems within the dressing room but for me, it would be a bit weird to see him back at Barca,” the club legend said on Thursday. Email “'What I miss about Barca is Messi and Suarez,' says Neymar but he reaffirms PSG future”. Feedback on “'What I miss about Barca is Messi and Suarez,' says Neymar but he reaffirms PSG future”.